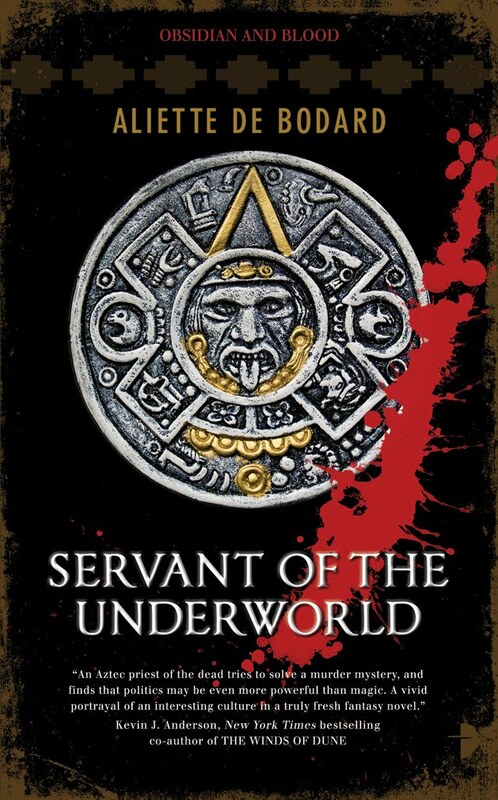 I read Aliette de Bodard’s Servant of the Underworld while I was increasing my experience of SF/F written by women. I’d picked it up because a couple of online reviews made it sound interesting (like an Aztec Cadfael not that I’ve read any Cadfael stories; but it sounded intriguing anyway). While it’s not necessarily always bad to see, I’m not so keen on seeing the same settings recycled in SF and fantasy. The recycling of Tolkienesque lands is not desirable. It tends to betray a certain lack of imagination on the part of the writer and, I think, makes genre fiction less accessible to those who may not enjoy these tropes. Having said that, I am sympathetic to M. John Harrison’s complaint (I realise that this sounds like a disease, but I’m of the mind to leave this as it is for now) that worldbuilding is dull. A balance needs to be struck between avoiding writing about the same places over and over (lest you end up writing about the same tedious situations all the time) and, in the rush to tell the reader about this wonderful new setting you’ve created or discovered, ending up with bloated, enervating tosh. There are plenty of exceptions, but I tend to find that loooong books are artless and dull. Hundreds of pages of worldbling or unnecessary plotting make for an unpleasant experience for the reader. So; what has this to do with Aliette de Bodard’s début novel? It is, as noted earlier a crime novel set in a fantastical world based upon the Aztec civilisation prior to the European conquests (to all intents and purposes it is the pre-conquest Aztec world, except with magic). This is to be welcomed – and it’s one of the things that attracted me to the novel. However, as I’ve noted above, I don’t like it when the world-building becomes the most notable feature of the novel. ‘The slaves will support you,’ I said. Perhaps this isn’t the worst example of this kind of dialogue that I’ve ever seen, but this does feel more as though it were written for the benefit of the reader than the other characters. One does tend to feel that, in a society which seems to have such a clear understanding of the rights and status accorded to you according to your station in life, there wouldn’t be any doubt in the mind of a given character as to how they, or others, could expect to be treated. Admittedly the countries depicted are a little more familiar to me, but Ian McDonald does this far more successfully in his recent novels. The places that his characters inhabit are full of vitality, but the journey there never feels laboured or, importantly, intrudes on the rest of the novel. This is key to my problem with Servant of the Underworld. While it’s certainly not the worst SF/F novel I’ve ever read for huge chunks of text informing the reader what the background to any given situation is, the dialogue becomes less believable when it’s as quoted above. Sadly, this did kill the novel a little for me and left me feeling more disappointed than anything else. I was looking forward to reading something a little different, but was left underwhelmed. The only really positive thing that I can find to say about it is that it does have an unusual and potentially interesting setting. This does, unfortunately, make me feel that the novel has failed, because (as noted above) I think that the world-building, while important, should never be the most notable thing about a novel. It can be a hook, and people should play with it, but in an unobtrusive manner. If this seems a little harsh, I remind myself that this is a début novel. I mentioned Ian McDonald’s excellent use of locales and people who don’t conform to the the unfortunate tendency of SF and Fantasy to be a little on the WASPish side (witness the complaints by some fans about the casting of Idris Elba in the Thor movie). Although as an aside, it is possible to find plenty of non-US/UK SF and Fantasy – The World SF Blog is a decent place to start. River of Gods, Brasyl and The Dervish House weren’t McDonald’s earliest novels; I haven’t read any of his earlier novels, but I’m given to understand that they aren’t quite so good (and in some cases, actually pretty bad). I’m not really willing to write off Aliette de Bodard as a writer having read one novel by her. My grumbles about the style of the novel aside, there may be enough to satisfy plenty of other people. It’s the story of Acatl, High Priest, an intelligent man with a great deal of mental and magical ability. He’s called in to investigate the disappearance of a priestess; his brother (an influential Jaguar Knight) is implicated in the crime. Acatl’s position and the crime he is required to investigate bring to the fore his troubled familial relationships and his inability to play politics. There is a lot of potential for human interest and universal themes to be explored (as well as the opportunity for some magic, derring-do and magical derring-do). Divested of the awkward dialogue and unsatisfying pacing, this would all have been quite a lot of fun. However, as I’ve suggested, things didn’t quite work out that way. Actually the plottimg (and the plot) of the novel were quite well handled. Everything is handled logically and it’s clear by the end how we arrived in this situation. Servant of the Underworld didn’t fail on every level for me, then. Some of my problems come from the expectations I had of the novel (not all; the style would grate, regardless of my expectation). I don’t disregard plot, it’s just that I think it’s easier to like a well-written book with little in the way of plot than it is to enjoy a well-plotted book indifferently written. Despite these complaints, I don’t think that the novel was beyond redemption. Though it wasn’t the most enjoyable reading experience I’ve ever had (it dragged a little) at least the author tried to do something a little different. There was just enough to make me try Aliette de Bodard’s next books and I’ll be reading the follow up Harbinger of the Storm soon. You say you like the plotting… Did it not bother you that the book starts off about Acatl’s relationship with his brother and his naive attitude to his job and then de Bodard just sets that aside and has him save the world from a rampaging god? I broadly agree with you about the setting, it’s fantastic. It’s just a shame that the novel is so weak. I have to confess that was a late addition. I felt a little curmudgeonly when I read over the rest of it. I think that the plot does in a looking-back-over-what-you’ve-just-read fit together reasonably well. Haha, but yes, the last few chapters are a bit of a jump. But I think that it had bigger problems than that. I really struggled to get through the novel (I had to leave it for a few days and go back to it), so I think my complaints about its style were born long before I’d reached that part. Funny thing is I’ve read reviews (in fact, the Strange Horizons one) which suggest that Acatl wasn’t a “tour guide.” Which, having read the novel, I can’t say I agree with. There was a great deal of poor dialogue in the novel, and I did feel too many conversations were directed at the reader. Almost makes me think that a couple of big info-dumps would’ve been better, that way the rest of it would’ve felt a little less stilted. Or maybe not. But, aye, it’s a real pity; the Aztec civilisation is surely a rich seam for writers to mine. That was what was at the heart of my disappointment. There was no life to the setting and its inhabitants; I didn’t particularly identify with any of the characters or find myself immersed in the Aztec civilisation (and to reiterate to… nobody in particular … “immersed in a world” doesn’t mean that you produce a book so filled with loving descriptions of the world that it’s a cube).